Clinic Synopsis: There are many concepts to focus on in the string and orchestra classroom. Concentrating first on the fundamentals helps us get to the music more quickly! This session will be useful to anyone teaching stringed instruments in classes. 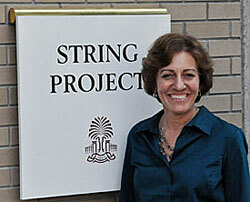 Featured: video examples of a beginning string class at the University of South Carolina String Project. Clinician Biographical Information Dr. Gail V. Barnes (B.M., M.M. University of Michigan; Ph.D. The Ohio State University) teaches at the University of South Carolina. She also serves as director of the internationally recognized USC String Project, a community program in which music education majors gain teaching experience by working with community children and adults. She has published articles in American String Teacher, The Journal of String Research, Update, Music Educators Journal and the Journal of Research in Music Education. She edited Applying Research to Teaching and Playing Stringed Instruments, a book that includes work by eighteen leaders in string education and is published by ASTA. Barnes eighteen years of public school teaching experience includes all levels of school orchestra.